The British Social Attitudes series provides a range of fascinating insights into the changing values of British society. The findings seem to suggest that we have become a less confident and less cohesive society, leaving little hope for David Cameron’s Big Society vision. Daniel Sage is impressed by both the wealth of information in the book and its snappy redesign, making for a much more user friendly experience. British Social Attitudes 28: 2011-2012 Edition. Alison Park et al. Sage Publications. 232 pages. December 2011. 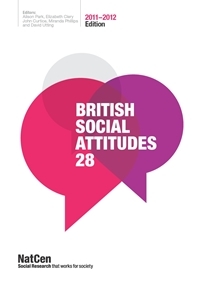 For nearly 30 years, the annual British Social Attitudes (BSA) survey has documented changes and continuities in British society. Throughout a range of areas, from welfare and inequality to sexuality and race, the BSA has been an invaluable tool for social scientists in understanding how and why public opinion shifts. It is unlikely, however, that a BSA survey has ever been conducted at a more important – and troubled – time. Over the past few years, British public life has been rocked by a series of scandals and crises. Whether it has been MPs, bankers or journalists, some of our major institutions have had public confidence shaken from them. At the same time, a new and largely unpopular government has taken charge over a faltering economy and introduced controversial reforms in public spending, health, education and welfare (and this is before any consideration of the August riots last summer). So amidst such a turbulent backdrop, how do the British people feel about their lives and the important issues that affect them day-to-day? The conclusions from this year’s report are pessimistic, to say the least. The British public are, according to the authors, “less engaged or willing to make sacrifices for the common good during challenging times”. In our attitudes and opinions on British society, we show signs of a “more fragmented society no longer underpinned by old certainties”. In gloomy times the BSA survey paints a gloomy picture of British society, but in what ways – and through which policy areas – does such pessimism manifest itself? One such area outlined in this year’s report is the weak state of British democracy. In 2010, turnout at the general election – at 65 per cent – was higher than in the previous two elections in 2001 (59 per cent) and 2005 (61 per cent). Nevertheless, compared to the previous seven decades – in which turnout never fell lower than 70 per cent – the 2010 election continued a worrying trend of weak democratic engagement. This year’s BSA report outlines some of the dynamics and reasons that underpin the delicate state of British democracy, with some worrying underlying trends. First, trust in both political parties and the integrity of the government is at a historically low ebb. In 1987, 47 per cent of the public trusted the British government to prioritise the interests of the nation over that of their party; in 2010, that figure has dropped to just 20 per cent. Second, apathy is now much more widespread than in the past. Back in 1987 a tiny proportion (3 per cent) believed it was not worth voting, now that figure is almost one in five (18 per cent). Third, despite new and arguably more engaging developments in the reach of politics – with 51 per cent watching a televised leaders’ debate and 31 per cent taking part in a digital election campaign – these new methods of democratic engagement failed to reach the most disconnected voters. It is clear there is still much work to be done to strengthen British democratic life. In the rest of this year’s report, some of the reasons why so many of the public feel alienated from politics are subtly alluded to. One reason might be the apparent disconnect between public opinion on social policy and the direction of reform taken by successive governments and, in particular, the Coalition. One of the Coalition’s key policies is expanding parental freedom in the realm of school choice, yet the BSA report shows that public opinion on secondary schools is complex and not particularly in harmony with government policy. Thus, while a majority show support for the basic notion of parental freedom and school choice, there are fundamental qualifications vis-à-vis equality and community. Large proportions, for example, continue to believe that parents should send their children to the nearest state school, while continuing to show support for considering the needs of all children and the desirability of educational equality. Equally, just as the current Government seeks to undertake the largest ever reorganisation and reshaping of the NHS, public support and confidence in the health service is at an all-time high. Seven out of ten people (70 per cent) are satisfied with the NHS: a remarkable increase of 36 per cent since 1997 and the highest ever satisfaction rate recorded by the BSA. The reach of public satisfaction with the NHS perhaps goes some way to explaining the scale of opposition the Health Bill; it also suggests, tentatively, that the impact of the Bill on frontline services will be closely monitored by an anxious public. There is one hint of optimism however, at least in terms of the future of the UK. As the referendum on Scottish independence draws near, we are likely to increasingly hear from the SNP that Scotland is a qualitatively different country – in terms of its cultural and political identity – than the rest of the UK (and in particular England). Yet the purported distinction between a ‘social democratic Scotland’ and a ‘liberal England’ is largely put to bed in this year’s report. Scotland is marginally more social democratic than England, yet as the report argues “for the most part the difference is one of degree rather than of kind – and is no larger now than it was a decade ago”. This is a vital finding for the unionist camp: it strongly suggests that through a careful and considered strategy, it may not be as difficult to accommodate the values and wishes of the Scottish people within the UK as Mr Salmond would suggest. As usual, the BSA series provides a range of fascinating insights into the changing values of British society. Further, this year’s report has been redesigned compared to others and now includes more snappy and visual summaries of the key findings. However, it does make for a rather depressing read: not through the quality of the writing or presentation of the evidence, but through the nature of its findings. As the report shows, we seem to have become a less confident and less cohesive society: and, as is aptly concluded, “if that’s true, what hope for the Big Society?”. Read the full British Social Attitudes report and summaries of the findings online here.